ORION Observatories (Optical Remote Observatory of New Mexico) is an Observatory complex located in the mountains of southern New Mexico. It's puropose is to allow romote imaging under the best possible conditions of seeing. It began consruction in 2007 and is the culmination of design theories that were years in the makng. ORION is most active during the dry season in New Mexico which, convienently, occurs during the opposite of the wet season in the Pacific Northwest. In other words, when in is cloudy and rainy in the PNW, it is usually excellent imaging weather at ORION and vice versa. Thus, between the two observatories, we have the potential to image around the year. ORION members include: Keith Allred, Peter Finnoff, Chris Murray, and myself (Jay Potts). ARGO Observatory (Astronomical Research Group of Oregon) is an observatory complex located in the high desert of central Oregon. In the summer of 1997 five Northwest CCD imagers built this observatory which consists of seven structures. Six of the structures serve as living quarters and remote operation centers from which all telescope and camera systems are operated - One of which is used by guests of ARGO. The seventh structure is a common building and serves as a power distribution center and comfort facility - Complete with rest room, toilet, shower, and wash basin. 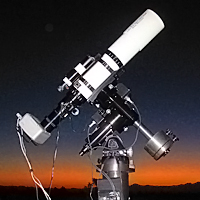 The site is most active during the spring and summer and fall as each member of ARGO takes advantage of the clear, dry and remarkably dark skies of this remote high desert environment. ARGO members include; Keith Allred, Tom Carrico, Peter Finnoff, Arnold Wittstein, and myself (Jay Potts). 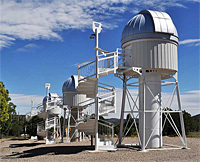 Construction of the ORION Observatory began in 2007 and is nearly complete with three of the four observatories operational. Sunset at the ARGO Observatory.